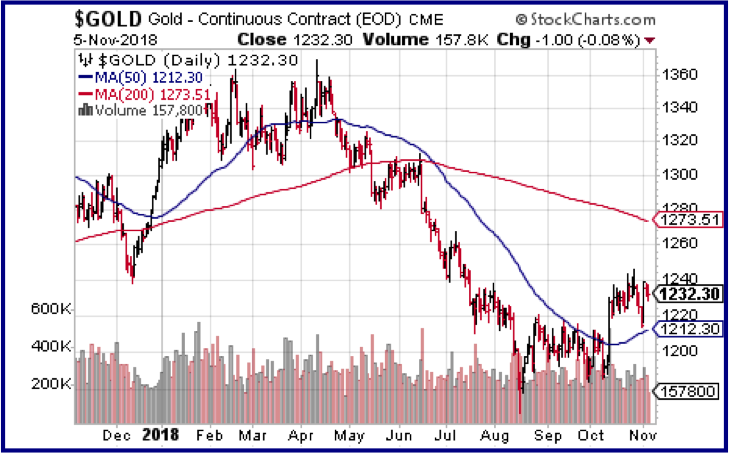 Market and other uncertainties have continued to support the gold price, even in the face of a US Dollar that started what looked like a bona fide breakout in the past few sessions. That may still be a fake out, but it's a positive sign when gold can move with the USD. While I still don't like fear buying, the fact I'm not convinced the Wall St correction is over is a good reason to be positive about bullion. In uncertain times, a strong gold exploration story often works as well as anything. Really good drill results can overcome even weak market conditions and weak metals prices if the company can keep the good intercepts coming. The company initiated in this issue has reported some of the best results this year and had good odds of reporting more. It's worth getting to know before it reports more results. As expected, Wall St put in a correction in the past three weeks. 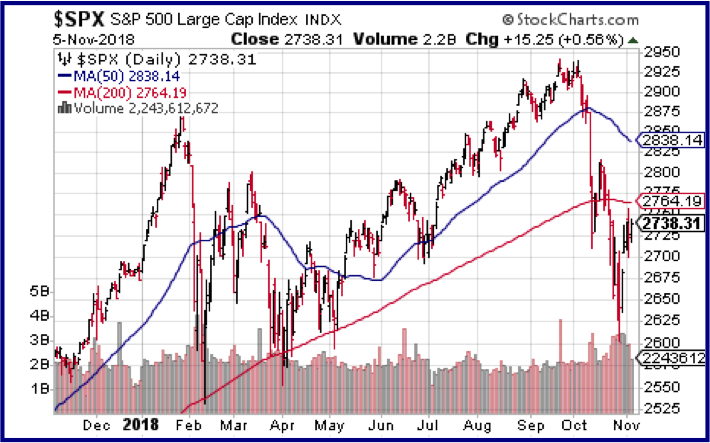 Admittedly, it was only barely a correction in the technical sense, with the SPX losing just over 10% and bouncing back almost immediately. That bounce has Wall St traders mostly declaring victory and predicting a quick return to recent highs. Perhaps. I think some of that Wall St optimism is due to the immanent US midterm elections. Not so much because the "right" outcome (whatever that is) is expected. More because they will soon be in the rear view mirror. I would agree with that viewpoint if I thought political uncertainty was the main reason for the correction in the first place. I don't. New York markets corrected because they were overvalued and the latest quarterly reporting from a number of big names disappointed. Forward guidance also got a lot more clouded thanks to economic slowdowns in other parts of the globe. That isn't a situation that is likely to self correct in the short term. There is little indication that things are improving elsewhere. And we've finally seen some cracks emerging in the might FAANG stocks. Big cracks. Most of the FAANG stocks are not just in correction but in bear market territory, 20% or more off their highs. This huge cap stocks have been a major underpinning not just for NASDAQ but for the SPX for years. They are all great companies in their way. Maybe they all pull the proverbial rabbit out of the hat, but it sure feels like the magic is gone. When traders stop believing companies like Apple and Alphabet can be routinely extraordinary, its tough for them to get their religion back. It might happen, but I'm skeptical its happened already. I think there is more readjustment of investor expectations required. The other reason I'm not sounding the all clear is the chart below. Bond yields, after dropping along with equity markets, have bounced back more positively than stocks. 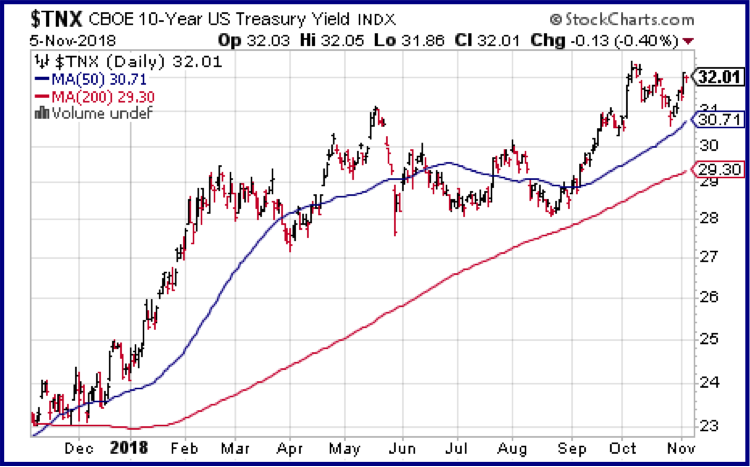 Yields are not quite at the recent highs that generated so much concern, but they are dammed close. There have been some weaker data points in US reporting but the most watched monthly statistic, non-farm payrolls, came in quite strong with a 250,000 gain. Year over year wage gains also ticked up, getting back to 3% for the first time in years. That helped move bond yields back near their recent highs. In addition to US midterms, there is another US Fed meeting ahead. There seem to be a lot of traders who expect a more dovish meeting, because of the Wall St pullback. I have my doubts about that. Wall St always expects the world to revolve around it but that doesn't mean it will happen. This meeting is tricky for the Fed because its so close to an election. I would expect the Fed not to change much, if only to convey an image of neutrality. Beyond that, I wouldn't be counting on a Fed reversal. It was never likely the Fed would raise this month. It's still highly likely it raises again next month unless markets really fall apart. That brings us back to the main topic of last issue's editorial. It still looks like the secular shift from falling to rising yields is alive and well. I noted last issue that equities can perform while rates are rising. They have done it in the past, but not for a long time. One issue we may yet face is that almost the entire population of Wall St and other financial centres literally have no experience dealing with a secular bull market in yields. They literally don't know what to do with themselves in that environment. I'm not sure how that plays out. Higher yields and troubles in Europe and elsewhere have supported the USD, which may have started a real breakout in the last few weeks. There have been a couple of higher lows and the USD Index is holding above 96. Notwithstanding the stronger USD, the gold price has managed to hang in around the $1230 range for most of a month. It's faltered a couple of times but, so far, has always come back to the $1230 level, often for no obvious reason. That is a strong performance when viewed alongside a strong US Dollar. Again, maybe gold is benefiting from political uncertainty. I'm not convinced of that, but we'll know soon enough. Once the US midterms are over, gold will settle down if domestic politics are the big issue, almost regardless of the election outcome. Gold producers have not traded that well but that is due as much to poor individual performance as anything. A lot of the majors have weak share prices because they reported lousy quarters. It will take more gold price movement to the upside to fix that. Gold still isn't having a great year, but it's looking less bad than a lot of its asset class competition. One of the most interesting charts I've seen recently is the one below from Bloomberg. 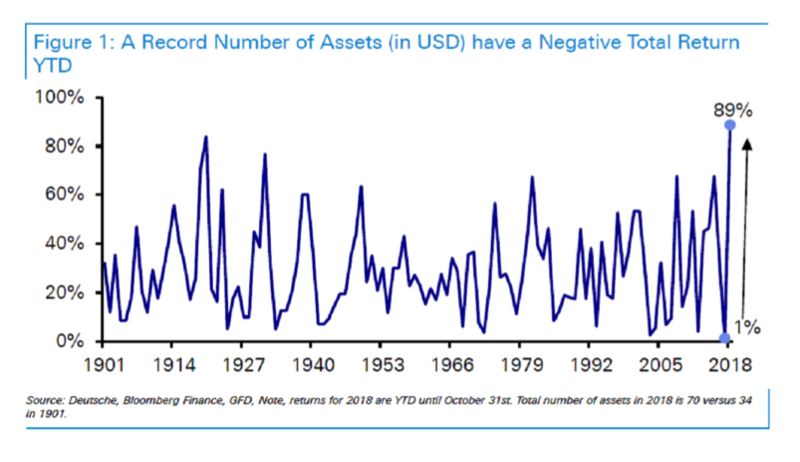 It charts the number of asset and assets classes that have a negative total return in USD terms, year to date. Currently, 89% of assets have a negative return YTD in US Dollar terms. That is the highest percentage in 100 years. Let that sink in for a moment. Yes, golds got a negative YTD return but its got LOTS of company lately. I can't help but wonder if part of the support for gold lately is the feeling among investors that not much else is working either. The sense of unease that could create could be underpinning both gold and the USD, both of which are considered value stores of last resort by many. The big markets may still resolve favorably, but it doesn't feel like that will happen quickly, and it may not happen at all.